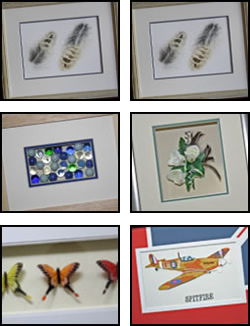 Have you ever wondered how to frame a picture or had the urge to try to make your own frame? Your Picture Framer can show you how by teaching at the speed you need. You can learn with either our top of the range professional equipment or items more suited to the hobby framer. We can tailor the training to whatever you want to achieve and at the end of the training you will be able to leave with at least one piece of your artwork framed. All our training is offered ‘one to one'; all the tuition is directed towards you. On other courses you could be sharing the attention of the tutor with 8 – 10 others. We will also offer support and advice for any questions or problems you encounter in the future. Should you wish to share the experience we can also provide joint tuition for 2 people. Your Picture Framer is able to design the training around you; we can be completely flexible, you can train with us at weekends and evenings at times to suit you. The training does not have to be taken in one day; if you prefer to take your time then the training can be spread over a number of days. Each course individually designed – to achieve what you want without covering things you already know.